Bet365 Poker is a part of the iPoker network, which is currently the largest poker network online in terms of cash game traffic. Bet365 is a large gambling site that, in addition to poker, also offers sports betting, finance betting, casino and bingo. 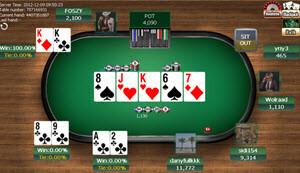 Bet365 Poker use poker software from iPoker. If you have played poker in any other poker room that is a part of the iPoker network, you will recognize the basics. The software is easy to use and you can have several tables active simultaneously. Bet365 is one of the biggest gaming website in Europe that offers a comprehensive selection of casino- and betting games such as slots, blackjack, roulette, bingo, sports betting and much more. Read more about Bet365 Casino to find out more about the games they offer. The fast poker variant available at Bet365 Poker is called Sprint Poker. As with any other type of fast poker, you never have to wait while other players finish a hand once you have discarded your hand. As soon as you discard a hand, you are moved to a new table where a new round is just about to start. Since Bet365 Poker is a part of the iPoker network, you will have access to the all the network wide iPoker tournaments as a member of Bet365 Poker. The weekends are best if you want tournaments with big guaranteed price pots. 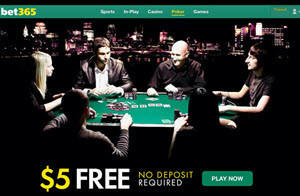 Bet365 Poker is a part of the iPoker network. This means that you will encounter players from many different gambling sites at the table. Examples of poker rooms online that are a part of the iPoker network are Titan Poker, Expekt Poker, William Hill Poker, Betfair Poker and Ladbrokes Poker. Most of the poker rooms in the iPoker network are not found on sites that cater to poker players only; they are found on sites that started out as sports betting sites and then added a poker room, a casino, a bingo room, etc. There is a lot of “spill over” traffic from sports betting and casino to the poker rooms, which in turn has given the iPoker network a (rather well deserved) reputation for soft play at the poker tables. A lot of the players are unskilled, or simply hobby players that prioritize having a good time and enjoying themselves while playing rather than meticulously grind away to make a long-term profit. At the time of writing, iPoker is the largest poker network online in terms of traffic to the cash game tables, but it is smaller than the independent poker rooms PokerStars, 888 Poker and Bodog. When you make your first deposit to Bet365 Poker, you get a 100% bonus up to a maximum of $500. As a member of Bet365 Poker, you will frequently receive offers about refill bonuses. Collect loyalty points by playing for real money at Bet365 Poker. Loyalty points can be traded in for cash or tournament tickets. 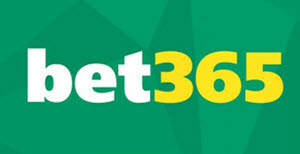 The Bet365 Poker support is available through phone, email and live chat. English speaking support staff is ready to help 24/7. If you reside in a European country, there will most likely be a free phone number for you to call. You can find out more bout this on the Bet365 side. The email address to the (English speaking) support is upport@customerservices365.com. Bet365 Poker is owned by Bet365 Group Limited, a big gambling company based in Stoke-on-Trent, England. The site Bet365 was launched online in 2001, by a family that had been running an offline betting shop in England since the early 1970’s. In 2005, the offline business was sold off to Coral.